Ole ole ole! Boom boom boom! The much love Radio DJ’s joined Yoshinoya Gyudon Eating Contest during the Media Challenge Leg. The voices that people usually hear in the radio takes a break from their board work and battled it out with other DJs during the Yoshinoya Gyudon Eating Contest – Media Edition held recently at Yoshinoya SM Mall of Asia in Pasay City. DJs and staff from participating radio stations were game as they chowed down bowls of Yoshinoya’s popular gyudon. Everyone did their best to qualify for the much-awaited finale of the Yoshinoya Gyudon Eating Contest, now on its 4th year. Finals will be this coming June at the Glorietta Activity Center in Makati City. By the end of this media challenge leg, Morly Allinio (2nd from right) from DZRH emerged victorious after flipping 4 bowls empty. 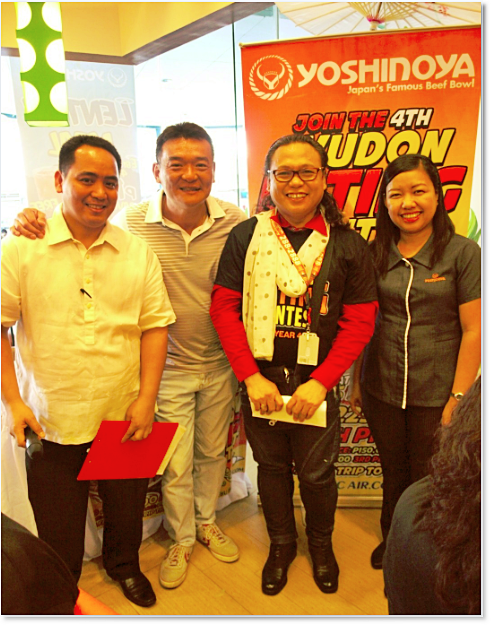 Also shown in photo are (from left), Mr. Orlando Galana from Yoshinoya who served as contest host; Century Pacific Philippines President, Mr. Timothy James Yang; and Yoshinoya Operations Manager, Ms. Lala Habana.